In the practice of yoga, we are here on earth to devolve virtues and remove vices. 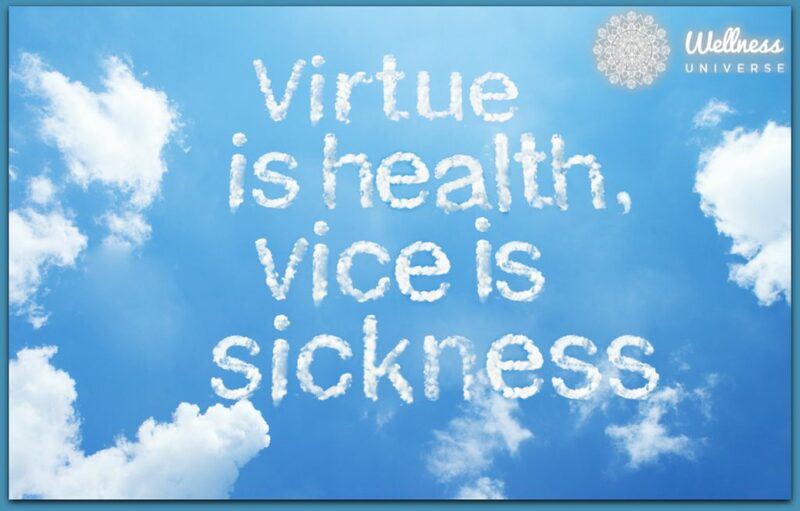 Virtues are forms of behavior that show a high moral standard where vices are considered immoral or bad behavior. Of course, what is considered good and what is considered bad is somewhat subjective. However, I think we can all agree that the following list might be good virtues to uphold this year. Our lives present us with content and thus the opportunity to discover through the process of living, the virtues we need to gain and the vices we need to remove so that we may evolve. For example, you may find that you are a very patient person who is gentle, peaceful, and loving. However, you may also discover that you are weak, indecisive and lack the steadfastness needed to accomplish your earthly mission. Life will then put you in a situation where you have the opportunity to discover your vices. What you do with this is how you create karma. To transcend Karma is to consciously act virtuously while removing the vices in each and every situation. When you are feeling weak and indecisive seek strength and balance. Just remember that for any society or group to succeed rules of order and codes of conduct must be developed. Otherwise, we risk chaos and destruction. The first is, to do no harm. This can be tricky. Let’s say you encounter a rat that is carrying a disease. What should you do? Look to the intent and remember, always act in a way that does the greatest good for the greatest many. The second is, to always give something back. Whenever you take something always give back something of equal or greater value. What you give you receive. The universe has a perfect accounting system. The third is, to be honest. If you always speak the truth a time will come when all you speak will be truthful. The world will often use you and create harm if you are not wise in your truthfulness. The fourth is, to live harmoniously with life. Our lives are defined by our relationships so seek to live harmoniously with everyone and everything. Discord only creates anguish. The fifth is to be kind, act wise and be at peace with what is. Accept what comes your way with kindness, wisdom, and peace. Acceptance does not mean indifference. It means to detach and let be while carefully observing the continual upward and downward flow of life. Life presents us with many opportunities to truly know ourselves. Let’s say you are a person of honor and integrity. You encounter a situation where another individual is doing something unethical. Let’s even say this person is financially successful while you are still struggling for money. Where is the justice in this? There is no justice in life. That is why we have laws. And the laws of karma simply teach us that life becomes what life does. Money comes and goes, but character lasts for lifetimes. So, choose wisely. It has been said that if we all could practice the truth and non-harm we wouldn’t need to concern ourselves with the other virtues. So, be kind and honest, and in this, you will live a virtuous life. You are as you think, so think peacefully and live well.